Scrutiny of Russia probe grows under new acting A.G.
Home Politics Scrutiny of Russia probe grows under new acting A.G. Critics say Matthew Whitaker might intervene to protect the president, while newly emboldened Democrats pledge vigilance. Acting Attorney General Matt Whitaker is only one day into the job and already he looms large over special counsel Robert Mueller’s investigation. Tens of thousands of activist-organized protesters gathered at 900 events across the country on Thursday night — including in Times Square and in front of the White House — calling on the new interim head of the Justice Department to recuse himself from the Russia inquiry because of conflicts of interest. The outspoken husband of White House senior counsel Kellyanne Conway co-authored a New York Times op-ed deeming President Donald Trump’s appointment of Whitaker — to replace the fired Jeff Sessions, for whom Whitaker served as chief of staff — as unconstitutional. On Capitol Hill, House Democrats still in celebratory mode after winning back majority status in Tuesday’s midterm elections convened an emergency conference call to discuss plans to investigate Sessions’ ouster when they have gavels and subpoena power in January. Whitaker’s promotion even surfaced at the start of a federal court hearing in Washington, where an appellate judge presiding in a case that centers on the legality of Mueller’s appointment told lawyers representing the special counsel and a former aide to longtime Trump adviser Roger Stone that they should plan to file supplemental briefs that address the change in command atop the Justice Department. To Whitaker’s critics, the newest member of the Trump boogeyman club is an inexperienced but loyal acolyte installed as Mueller’s new supervisor to make under-the-radar moves designed to protect the president. They vowed to be vigilant in watchdogging him. Trump’s allies countered that Whitaker is a welcome new face replacing Sessions, whose own recusal from overseeing the Mueller investigation and all other matters tied to the controversial 2016 election has long frustrated the president. “Terrific!” John Dowd, the president’s former personal attorney, said in an email to POLITICO when asked for comment about Whitaker’s appointment. Trump’s current team of lawyers insisted on Thursday that the appointment of a new attorney general would not affect the way they interact with the special counsel. “I think that any rational decision maker would come out the same way on this as a lawyer, so I don’t know how much difference it makes,” Trump attorney Rudy Giuliani said in an interview. Under DOJ regulations governing his position, Mueller is actually not subject to daily supervision from anyone in the department. But Whitaker, who before joining Justice made dozens of public comments critical of the special counsel appointment, has now picked up veto power for some of Mueller’s most important moves. 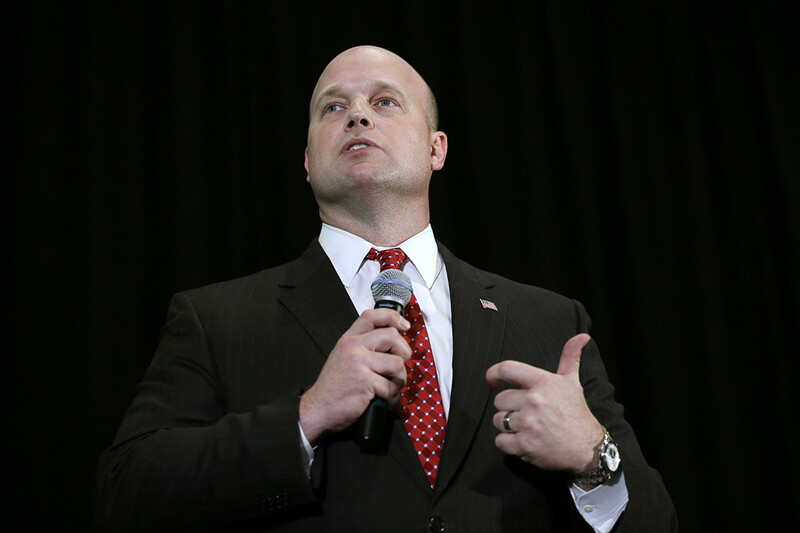 Whitaker’s new role means he is primed to have immediate influence over Mueller ahead of key court dates involving cooperating government witnesses, including former Trump campaign chairman Paul Manafort (a pre-sentencing status report is due Nov. 16); former Trump personal attorney Michael Cohen (a sentencing date is set for Dec. 12 in a case in federal court in New York referred by Mueller’s office); and former national security adviser Michael Flynn (a sentencing date is set for Dec. 18.). The new acting attorney general is also positioned to weigh in on a topic central to the president who just appointed him: whether Mueller can subpoena Trump and force his testimony. Giuliani on Thursday said the president and his lawyers were scheduled to have a critical meeting next week to discuss whether to respond in writing to a first round of written questions. Once that decision is made, Trump’s attorneys and the special counsel can re-engage in negotiations over a sit-down interview that would cover topics related to Trump’s time in the White House — including the May 2017 firing of FBI Director James Comey that spawned a probe into whether the president committed obstruction of justice. No subpoena has been issued for Trump’s testimony yet, but Giuliani said that talks with Mueller on the topic could still break down and result in a high-profile legal fight. “We both agreed to leave it open to discussion,” the president’s lawyer said. Whitaker has final say over major Mueller moves involving indictments. And while those kinds of actions have largely remained under wraps until they are unsealed in court, several members of the president’s inner circle of longtime aides, associates and family members, including Stone and Donald Trump Jr., remain in the crosshairs. The acting attorney general will also have an important role in Mueller’s end game. The special counsel at the end of his work must submit to Whitaker a confidential final report explaining why he chose to bring charges against some people but not others. A decision on whether to make that report public will rest with Whitaker. Whitaker can’t totally stifle Mueller. The DOJ regulations also require the acting attorney general at the end of the Mueller investigation to issue a report to the chairs and ranking members of the House and Senate Judiciary committees spelling out any major moves the special counsel wanted to make but that got vetoed. “He’ll have to take the heat for those if it looks like those were politically motivated,” said Mary McCord, a Georgetown University law professor and former DOJ official who helped oversee the FBI’s Russian-meddling investigation before Mueller’s appointment in May 2017. Trump, of course, has been no fan of the Mueller inquiry since its start. During his post-election news conference on Wednesday, the president mused about his power to end the investigation if he wanted to. “I could fire everybody right now, but I don’t want to stop it because, politically, I don’t like stopping it,” Trump said. But with Whitaker now atop the Justice Department, one less-noticeable way to meddle with Mueller would entail repealing or rewriting the underlying DOJ regulations in a bid to shutter the special counsel’s work or to eliminate the requirement for congressional notice whenever he’s overruled. A DOJ spokeswoman declined comment on Thursday when asked whether Whitaker had any plans to rewrite the underlying special counsel regulations. Before joining the department, Whitaker suggested during a CNN interview that one way to stymie Mueller was for a new attorney general who replaces Sessions to reduce his budget “so low that his investigation grinds to almost a halt.” But that train may have already left the station — at least for the next 10-plus months, because Mueller got approval in July from Deputy Attorney General Rod Rosenstein for his spending through the end of the current fiscal year. For now, Mueller appears to be full steam ahead — no matter who’s atop DOJ. On Thursday, Deputy Solicitor General Michael Dreeben, who represents Mueller’s office, argued in federal appeals court that Mueller’s supervision was one of the critical elements backing up why his appointment is constitutionally sound. “It’s not the case that the special counsel is off wandering in a free-floating environment and can decide when to report,” Dreeben said during oral arguments in the case, which centers on a Mueller subpoena to compel testimony from Andrew Miller, Stone’s former aide. Also Thursday, the special counsel’s office appeared to file a 12,970-word sealed brief, a sealed motion and a sealed supplemental appendix in federal appeals court in a mystery case involving a different fight over one of his grand jury subpoenas. Sessions’ status atop the Justice Department had long been tenuous. And some observers say Mueller appears to have been operating with that in mind, noting his moves to hand off some of his work to other U.S. attorneys around the country. Jon Sale, an assistant special prosecutor during Watergate and a close friend of Giuliani’s, said he expected that Mueller had prepared for possible meddling from above by interviewing witnesses with FBI agents in the room, rather than bringing them before a grand jury where the testimony is more difficult to share. He also said the special counsel could have filed both sealed indictments and grand jury reports in federal court, where a judge would have the final say on their release. “I have no doubt the people in Mueller’s office have a contingency plan,” Sale said. Politically, Whitaker has become a launching pad for Trump critics, who on Thursday used his appointment as the rallying cry for a mass protest organized to support the Mueller investigation. “We’ve always conceived of this as a show of opposition and a deterrent force to make noise if something like this did happen,” Leah Greenberg, one of the former House Democratic aides who co-founded the liberal anti-Trump network Indivisible, said in an interview about the protests. Indeed, the Sessions-Whitaker shakeup was front and center as protesters gathered from Dayton, Ohio, to the Boston Commons. Two of their hashtags — #NoOneIsAboveTheLaw and #ProtectMueller — were trending on Twitter.